BF2-Master wrote: We have something new -- thanks again to Delta! I'm making some progress on a couple custom units but not much worth showing yet. 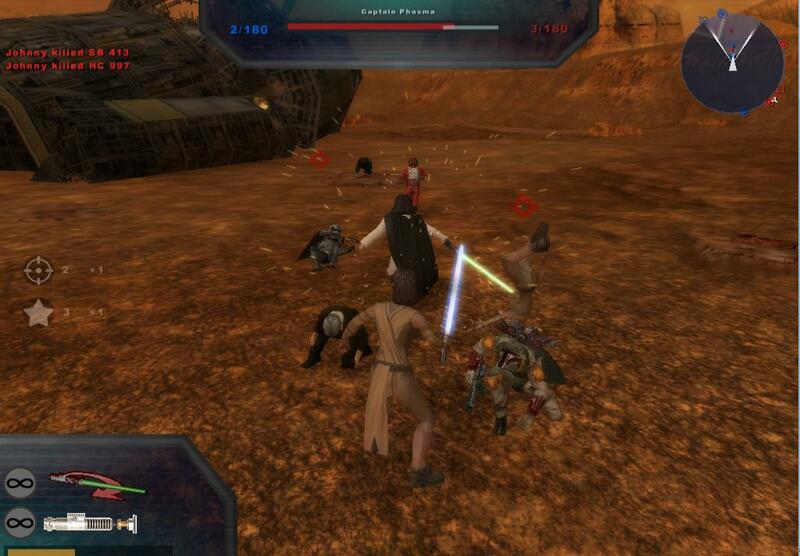 A Force Awakens Mod Hero Assault??? Excellent, I love custom hero assaults, shows people want to make a very enjoyable map! I can not wait to see the units you have worked on once they are complete! Let me know what you think - this is all really rough from a munge a few hours ago. I'm having a lot of trouble with CW so far and I was planning to do that first. I'm still working on this map somewhat, but I'm kind of unsure what else to do, besides keep trying to fix CW. I don't feel done, but I'm unsure how to proceed with the rest of it. Should I just release a BETA after the next round of tests? BF2-Master wrote: I'm still working on this map somewhat, but I'm kind of unsure what else to do, besides keep trying to fix CW. Should I just release a BETA after the next round of tests? That is totally up to you, you might be trying to make this harder than it seems by trying to do more when there is really nothing more to do. Whether you release a BETA or not, I still await the day this gets released. Anyone up to BETA this map? I have one tester but I'd like at least two. For sure, i'd love to help out! I've got plenty of time this weekend and not much else to do. I'd love to beta test this map, I've been following it for a while! Hey guys. I know it's been months but I wanted to post an update. I plan on resuming work on this map next month. I've been busier than ever before in my life with school and I have to admit in the wake of Star Wars being scheduled around the holidays now, my interest for Star Wars wasn't at peak during the early summer months. I have a file with all of the bugs/glitches reported to me from the BETA testers to be fixed, including the localization errors. I have a few small ideas to improve the map. As a side note, I plan to release two edits in the final map for mission.LVL - one with only a couple modes (Conquest, Assault) for the stock eras, and one with all modes for all three eras. This way mission conscious players have an option. Anyway, I have every intention of finishing this and releasing it in the near future and I'm sorry for the delays. EDIT: also considering changing a few heroes. any thoughts? particularly for CW. Tarkin and Wedge will remain but I may change Wedge a bit. Figured out some of the recent bugs. I'm glad I took time off from the map because coming with a fresh perspective is making things smoother. Not much of a skinner, but really proud of how these LEGO-inspired Geonosis Troopers came out. So question - what kind of clones should I use for what modes? Conquest/CTF - phase I or phase II? both stock, but maybe with the ARC Captain for ep2. I'm leaning phII clones for all modes but classic just because stock Geonosis uses ep2 clones and so much of this customization has been about departing the stock Geonosis, but I'm open. I like the colors on the Geonosis trooper, but I think it would be cool if the colors could be integrated a little more, right now there's the lighter part, and the darker part, I think it would be cool if there were lighter parts within the darker area and vice versa, if that makes any sense. 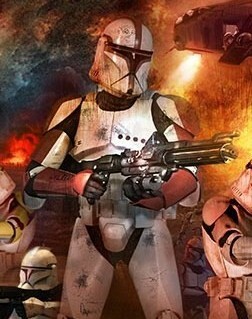 ARCTroopaNate wrote: I like the colors on the Geonosis trooper, but I think it would be cool if the colors could be integrated a little more, right now there's the lighter part, and the darker part, I think it would be cool if there were lighter parts within the darker area and vice versa, if that makes any sense. Yeah, I think so! I tried to take it easy on the first shot because I'm not an experienced skinner but it should definitely lean a little more camo the next shot I take before release. Thank you! No problem! Lego star wars can make for good source images! 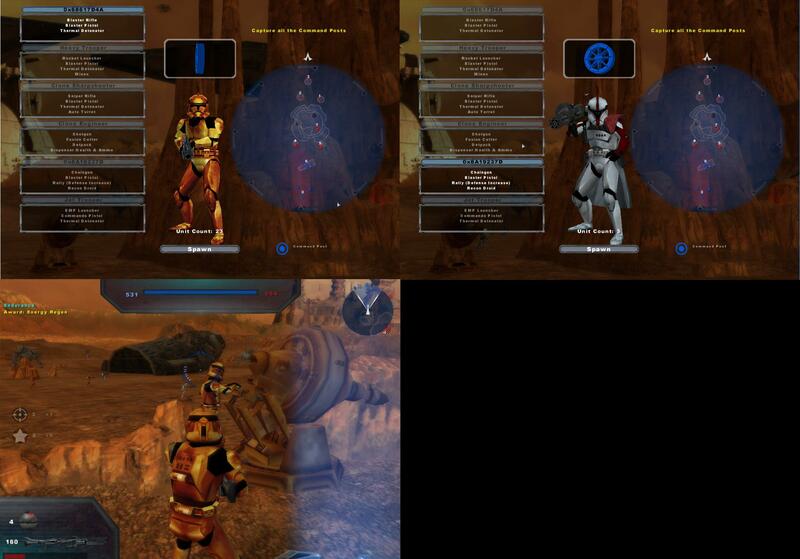 Nice skin with the clone trooper. I too like the way that Geonosis clone trooper turned out! If you are thinking of changing some heroes, maybe throw in Kit Fisto and Padme Amidalla, I do not see them very much in CW Era type recreations of the first three episodes from Star Wars. Thanks for the constructive criticism guy! Going to try a new Trooper skin in the next few days.